Part murder mystery, part historical fiction, part romance… this book had a lot going on but everything was intertwined to create a rich story. 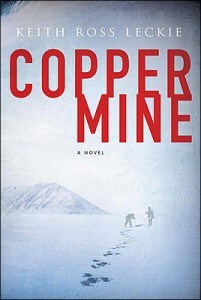 In 1913 two priests head into the barren north, intending to convert the Copper eskimos to the Christian religion. They never returned. Jack Creed is a North West Mounted Police officer, charged with finding the priests or determine what happened to them. He hires a young half-eskimo, Angituk McAndrews to accompany him as an interpreter. They find the bodies of the priests at Bloody Falls (named for a massacre that happened occurred there many years before). Their killers admit to the murders readily and Jack must return them to face trial at the hands of white society. It took him nearly a year to get there and now he’s faced with travelling another year with two prisoners and he’s uncertain where the loyalties of his young companion lay. This book provided much insights into the belief system of the Eskimos and their way of life. Jack is torn with his duty to uphold the law and the people he has come to know during their trek. The author has been a scriptwriter for 30 years and his credits include multiple miniseries for CBC such as Everest!, Milgaard and The Arrow. This book could be destined to become another miniseries and if it does, I will probably be one of the people sitting down to watch it. Read this book!